← The new room sux. Today is 20.07.2007 = 20072007 I shall post something backlog and one of the best time i had in my life. Few weeks ago, my uni student union organized a welcoming party for us TAR student. The theme for the night was Summer Beach Party. So we are supposed to wear like how we would dressed to beach. Unfortunately, it was kinda impossible as it was COLD! Over here, you wear sweater, coats or jumper out.. To clubs or pub or the nearest supermarket. Anyway, it was a very happy occasion as almost 90% of my course mate went and we had free garlands to wear. As usual, i brought my camera out but i forgot to slot the sd card in. Pandai kan? T__________T useless! Whole nite have to carry the heavy camera around. It’s was quite boring at first. Just sitting and waiting around for the performances to start. Just some performances by seniors and students. Jumping and strutting around on stage with bikini and corsets. hehehe.. Lazy to post those photo. From the interval onwards, i had the best time in sheffield to date. Seriously pure fun! Don’t really know what got to us, but everyone was laughing and dancing for the rest of the night. It started when we knew Weai brought her camera. Photo with resident of Flat 57 and me 17. Quite sad i couldn’t move in together with them. 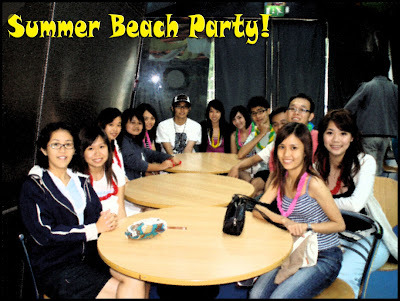 And then thanks to Seow Yee (no more cleaner) for introducing these great group of friends to us. Drink so much bud that night. Celebration for someone who got First Class. Wohhoo..! Without them, i think the night wont be even half as fun as it had been. With this, thanks LadyCleaner, opps Seow YEE!! Muaks Muaks! This entry was posted in friends, partypartyparty and tagged sheffield. Bookmark the permalink.